It's that time of year again. What time? you ask, thinking perhaps of returning robins, snowdrops in flower, garden catalogues stuffed in your mailbox. 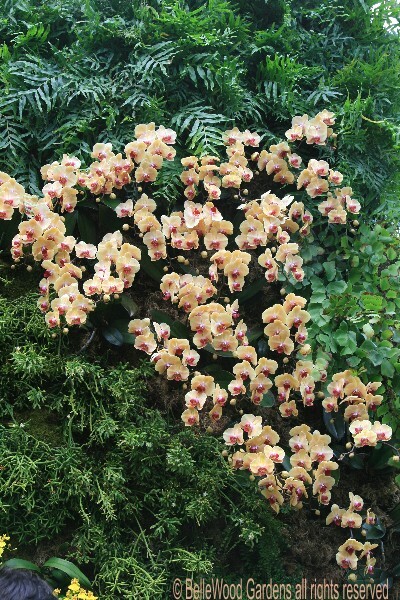 Why, it's time for the orchid show at the New York Botanical Garden. Originally designed by garden staff, now the exhibits are orchestrated by outside designers: Broadway stage designers, a landscape architect born in Cuba. 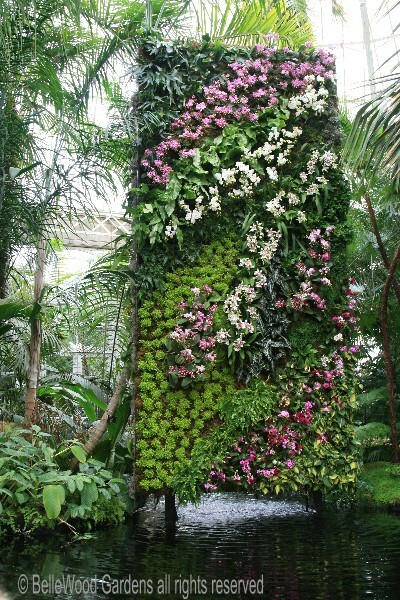 This year, 10th in the series, the designer is Patrick Blanc, a French botanist renown for his innovative green walls. 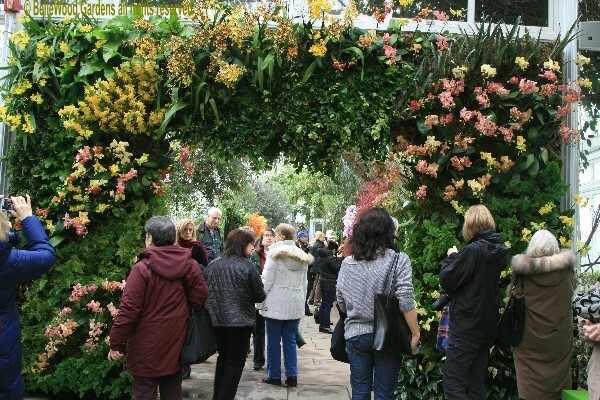 While the orchid show is a temporary installation, the concepts are the same. 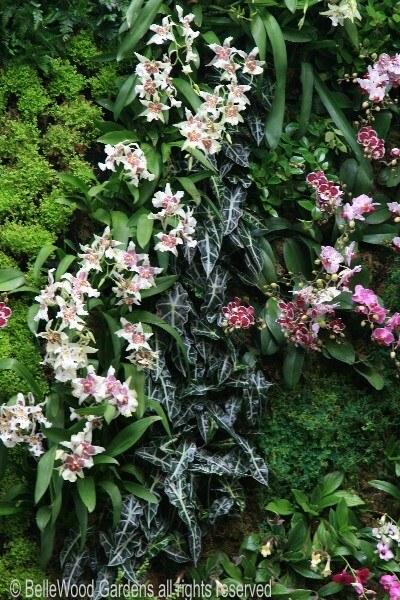 Patrick has created sweeps and swirls, drifts of foliage shapes and colors on several huge panels that have then been embellished with drifts of orchids. their glossy surfaces neatly marked, pencilled with silvery veining. 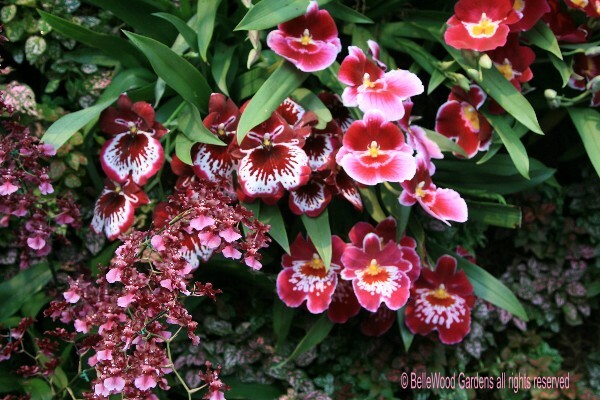 And, but of course, orchids - white, pink, golden, green, speckled. 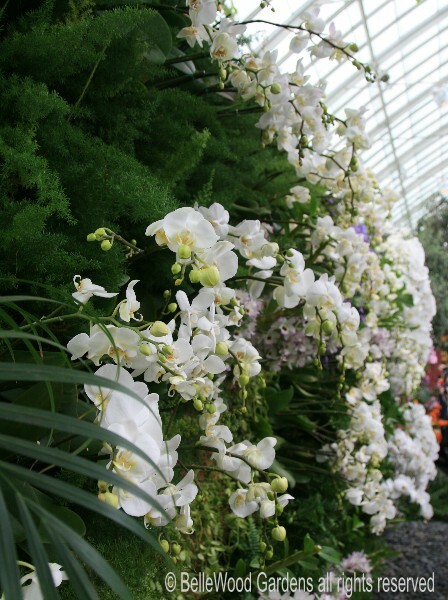 A wall of white orchids flanks the stone walk of the seasonal exhibition wing. 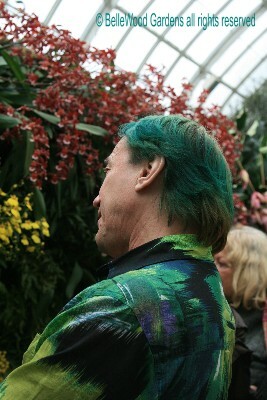 New York Botanical Gardens gets you in to see the show the day before it opens to the general public. there would be once the show opens. And they all seem to have a camera. If not a camera, a cell phone. 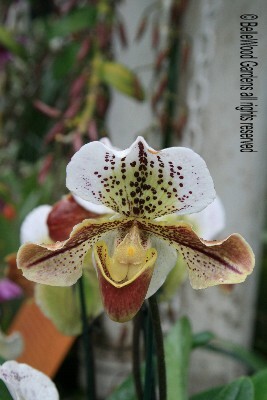 flower with a mellow lipstick red band on it labellum (supposedly to attract pollinators.) Attracted me. I don't know what this is. Until I find out, let's just call it a Pink Whatsit. Love the form, its size and let's not forget the color, soft blushing rose pink. 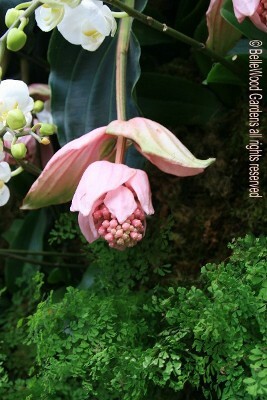 UPDATE: This is, drumroll please, Medinilla magnifica, and there's a nice little article about it here on the New York Botanical Garden's plant talk blog. 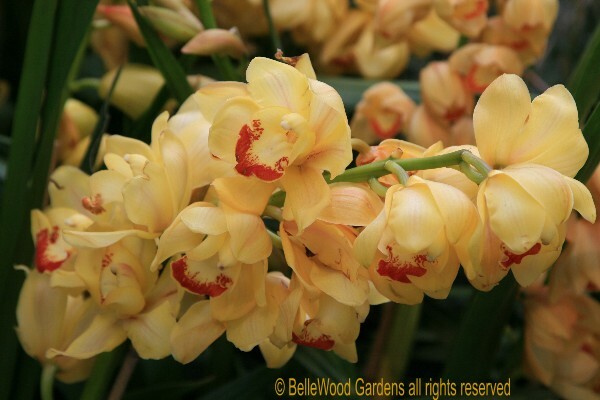 Orchids are, we must not forget, the most diverse of flowers with funky forms and fabulous color. 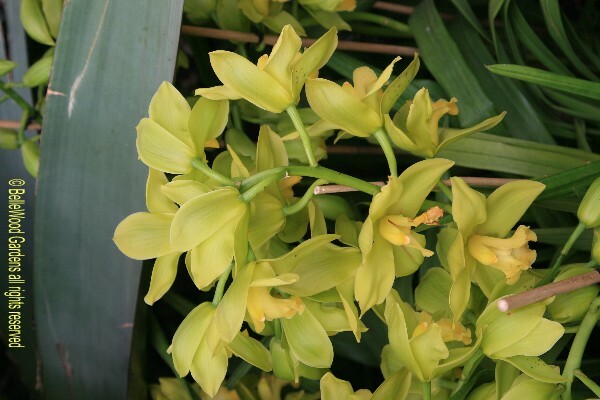 Phalanopsis, with disc-like flowers, each reminiscent of the full moon. 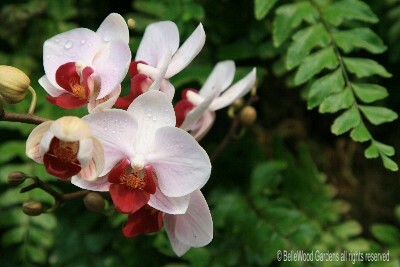 Another phalenopsis, nestled amid ferns and bedewed with water droplets. they are exquisite, with a glistening enamel-like finish. Green, a waterfall of maidenhair fern. Pilea, familiar as a terrarium plant. 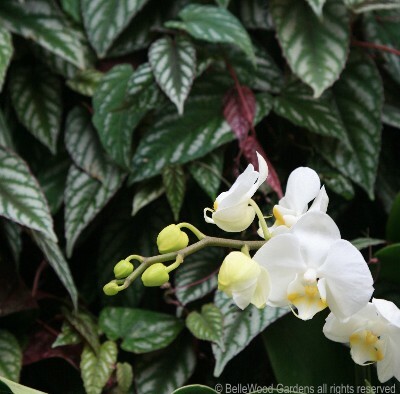 And dancing over all - orchids, the focal point and epitome of this exhibition. Miltonias in several shades of rose and pink cavort with airy sprays of a smaller flowered orchid. vanished in face of the show's energizing appeal. 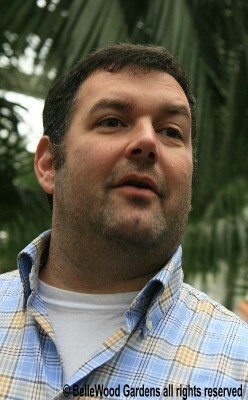 that I also admire. 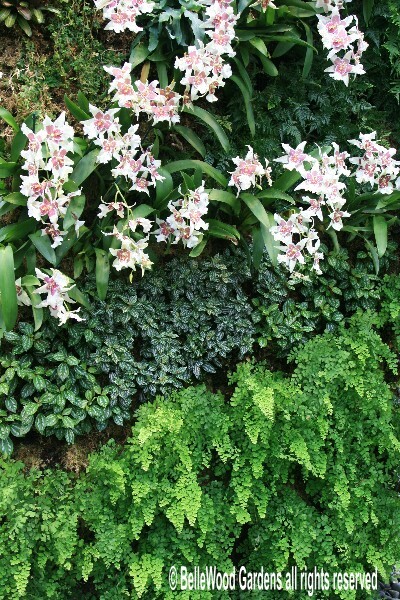 In designing gardens one should, after all, consider the leaf. 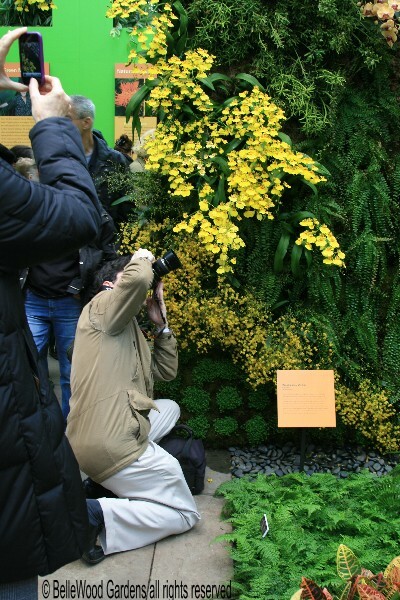 The Orchid Show: Patrick Blanc's Vertical Gardens is open from March 3rd through April 22nd. The hours are Tuesday through Sunday, 10:00 a.m. to 6:00 p.m. Closed most Mondays but open April 19. 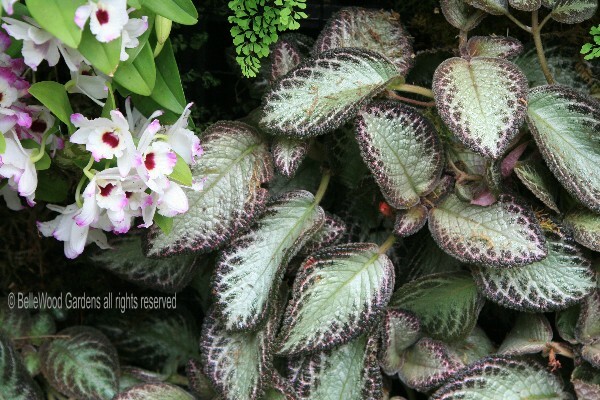 Here is a link to the New York Botanical Garden's description and ticket ordering site.